GALVESTON, Texas (AP) — Marine archaeologists made a thrilling discovery this week while examining a well-preserved shipwreck deep in the Gulf of Mexico — two other sunken vessels that likely went down with it during an early 19th century storm. Much isn't known about the ships, including the flag or flags they sailed under and the year they sank about 170 miles southeast of Galveston. They came to rest 4,363 feet, or nearly three-quarters of a mile, below the surface, making them the deepest Gulf or North American shipwrecks to have been systematically investigated by archaeologists, the researchers said. "What you're going to see and hear I hope will blow your mind. Because it has ours," lead investigator Fritz Hanselmann told reporters at a Thursday news conference in which the team revealed its initial findings. "We went out with a lot of questions and we returned with even more. The big question we're all asking is: What is the shipwreck? And the answer is we still don't know," said Hanselmann, a researcher from Texas State University in San Marcos' Meadows Center for Water and the Environment. 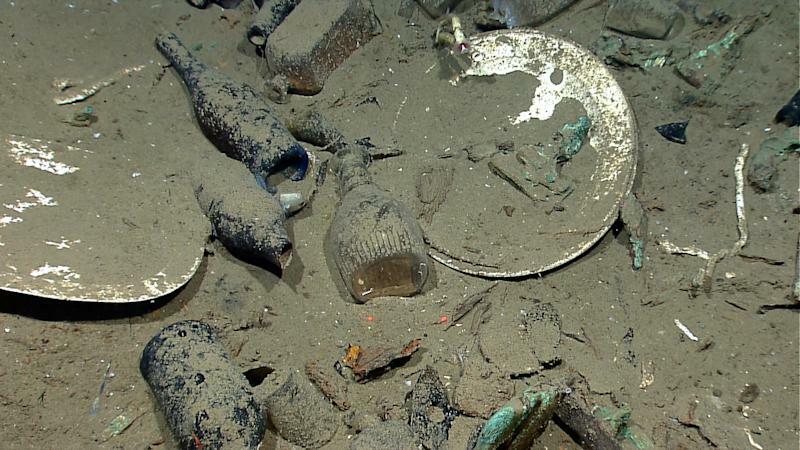 During eight days of exploration that ended Wednesday, the scientists used remote-controlled machines to recover more than 60 artifacts from the initial shipwreck site, including musket parts, ceramic cups and dishes, liquor bottles, clothing and even a toothbrush. The artifacts, including china from Britain, ceramics from Mexico and at least one musket from Canada, will help researchers determine the ships' histories, Hanselmann said. "Nationalities, cultures, all collide in these shipwrecks. We hope to return in the future next year with more work," he said. Although they weren't allowed to retrieve artifacts from the two new sites under the terms of their agreement to examine the initial one, the researchers took thousands of photos and closely examined the wreckage of all three ships, which came to rest within five miles of one another. Two of the ships were carrying similar items, and researchers believe they may have been privateers, or armed ships that governments would hire, Hanselmann said. The third vessel was loaded with hides and large bricks of tallow, suggesting that it may have been a prize seized by the privateers. The artifacts are headed for preservation work at a Texas A&M University research facility. "For now, there's lot of conjecture, lots of hypotheses," said Jim Delgado, the director of the Maritime Heritage Program for the National Oceanic and Atmospheric Administration. "We may have answered some questions, but we have a large number of new questions. But that's archaeology." Delgado said the ships likely went down during the first two decades of the 1800s, which was a time of great upheaval in the Gulf region and in the New World, in general. "Empires were falling, Spain was losing its grip, France was selling what it has, Mexico becomes independent, Texas independent, Latin America becomes independent and the U.S. is beginning to make a foothold in the Gulf," he said. "So these wrecks are all tied to that, we are sure." It's likely each ship was carrying 50 to 60 men and that none of them survived. Among the wreckage were telescopes and other navigational tools that survivors likely wouldn't have left behind if they could have helped it, the researchers said. Delgado said the ship the team set out to examine was armed with six cannons and may have had two masts. Undersea images show the outline of a copper-clad, 84-foot-long by 26-foot-wide wooden hull. A Shell Oil Co. survey crew notified federal Interior Department officials in 2011 that its sonar had detected something resembling a shipwreck. It also detected some other material. "Like a medical ultrasound, interpreting can be difficult," said Jack Irion, of the federal Bureau of Ocean Energy Management. "This case is the same way. 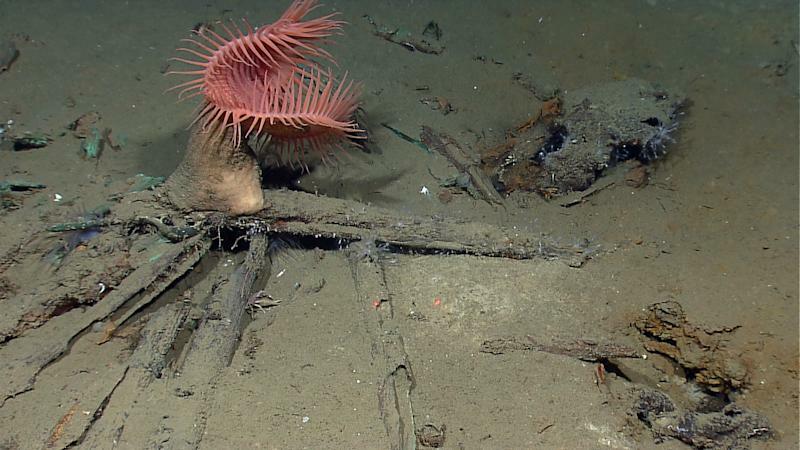 You can't tell if it's an historic shipwreck or just a pile of stuff." A year later, a National Oceanic and Atmospheric Administration vessel examining seafloor habitat and naturally occurring gas seepage used a remote-controlled vehicle to briefly examine the wreck. Besides determining the ship's dimensions, the examination showed it to be undisturbed and likely from the early 19th century. That ship has been dubbed the "Monterrey Shipwreck," adopting the name Shell had proposed for its development site. Researchers have examined several other historically significant Gulf shipwrecks in recent years. In 1995, after a more than decade-long hunt, Texas Historical Commission archaeologists found one of famed French explorer La Salle's vessels in a coastal bay between Galveston and Corpus Christi. The remains of the LaBelle, which went down in a storm in 1686, have been recovered and are undergoing an unusual freeze-drying treatment at Texas A&M. The ship is to be reconstructed next year and become a centerpiece of the Bob Bullock Texas State History Museum in Austin. 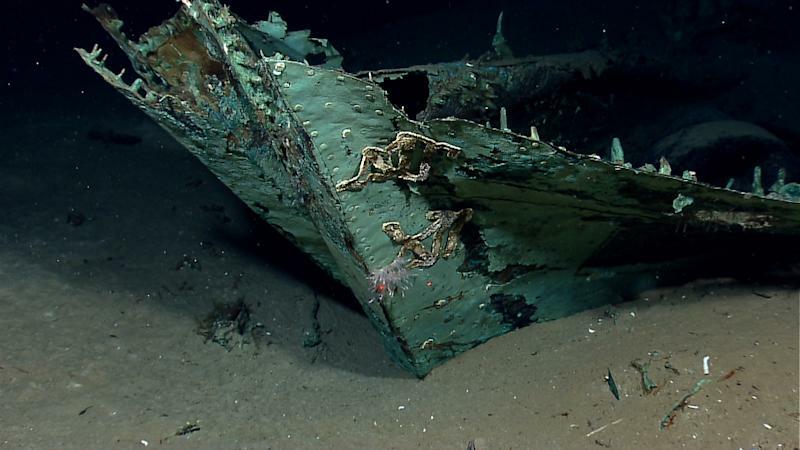 Earlier this year, researchers used special 3-D imagery to map the remains of the USS Hatteras, which was the only U.S. Navy ship sunk in the Gulf of Mexico in combat during the Civil War. The 210-foot iron-hulled ship went down in 1863 about 20 miles off the Galveston coast during a run-in with a Confederate raiding vessel. Researchers believe that heavy storms in recent years shifted the sea floor sand and exposed the wreckage, which rests 57 feet below the surface. Empower Texans Sues Lawmaker Over Press Passes. But Is It a News Organization or Lobbyist?